Pastor Willio (the Haitian native who runs the orphanage) met us in Dajabon and, after a few complications and forking over the appropriate cash at the DR border (a.k.a. bribes), we were finally ready to enter our destination. While we stood around getting our passports checked, a guy behind me tried to pick my pocket. Little did he know I was a savvy world traveler and didn't have any goods in my pocket. I just smiled at him and moved away. Crossing the Rio Massacre. There's little written on the Rio Massacre genocide as far as I can tell. True to its name, it was a bloody battle fought in the 1930's at the river that divides Haiti from Dominican Republic. 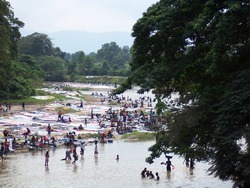 A typical "racial cleansing" attempt, approximately 25,000 African-Haitians lost their lives, and from the account of locals, mostly baby boys. The method, Pastor Willio told me, was quite grizzly. The Dominicans would toss a baby up into the air and catch it on their sword. When we got onto the bridge, I noticed hundreds of Haitians standing out in the river and on the river banks, washing clothes and swimming. The river was filthy and I couldn't imagine that anything could get clean in it. 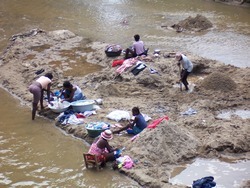 It also appeard that many of the Haitians on the bank actually sleep/live on the banks. The United Nations (UN) was stationed right at the border for border control and peacekeeping, and they welcomed us with friendly smiles and escorted us across. Most of them were from Uruguay. This did make us feel safer, knowing they were within less than a mile of the town we would be staying in. 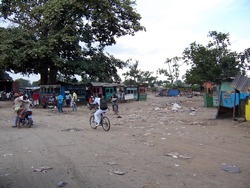 The most extreme poverty-stricken Haitians we saw were living and milling about the border, just waiting for a chance to get across. Dozens of them even stand at the gates all day, just hoping for something to happen—I don't know what that something might be—to allow them entrance. It was extremely sad to imagine their desperation. My first impression of Ouanaminthe was this: I tried to imagine the worse case scenario that my mind could conceive beforehand, just so I could be prepared. It was every bit as bad as I imagined. BUT! Driving over the muddy potholed streets on the way to the orphanage, taking in the poverty, desperation, filth, boredom, and hopelessness, I had a strange stirring in my heart. I felt very, very alive. Moreso than I had in a long time. One of the most impacting events of the trip for me happened next. 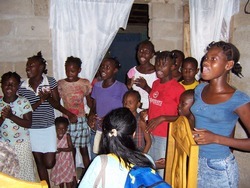 As we approached the orphanage, the sound of glorious, exuberant, passionate music filled the neighborhood. It was all the beautiful eager voices of the once-abandoned children, donning their red Hopegivers t-shirts, welcoming us to their home. I got quite emotional watching these children with so little, singing as if they had everything to sing for. They were so happy to see us! And as I touched, hugged, and played with these children for the rest of the afternoon, I was in awe of this thought. Today, I saw Jesus. Today, I heard Jesus. Today…I held Jesus. Thanks for the helpful article. It is also my belief that mesothelioma has an very long latency period of time, which means that symptoms of the disease may not emerge right up until 30 to 50 years after the primary exposure to asbestos fiber. Pleural mesothelioma, which is the most common variety and influences the area around the lungs, will cause shortness of breath, breasts pains, including a persistent coughing, which may lead to coughing up bloodstream.